My husband and I flew to DC the day before the march on a plane packed full with other march-goers. 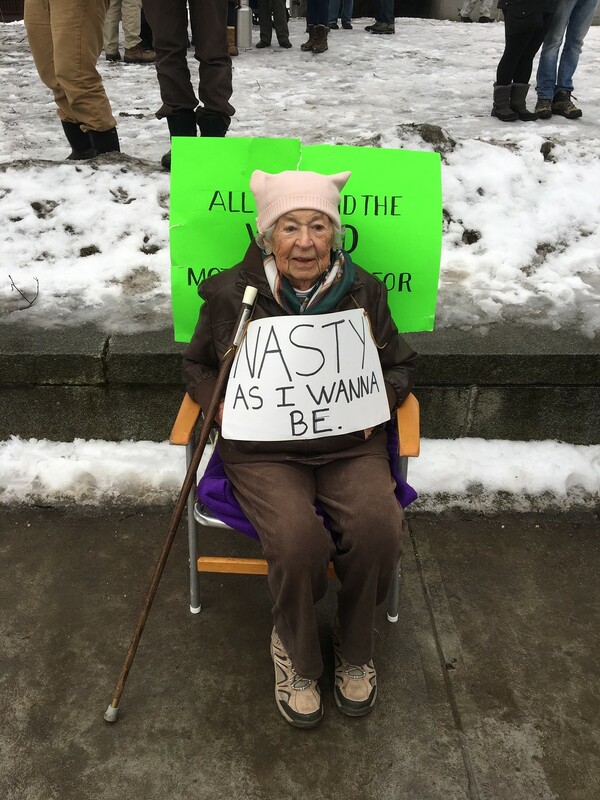 Friends who stayed in Vermont participated in the Sister March held on Saturday in the state capitol, Montpelier, where the State police estimate there was a crowd of nearly 20,000 — in a town whose total population is just over 7,500. Check out two of my favorite photos from that march, here and here. 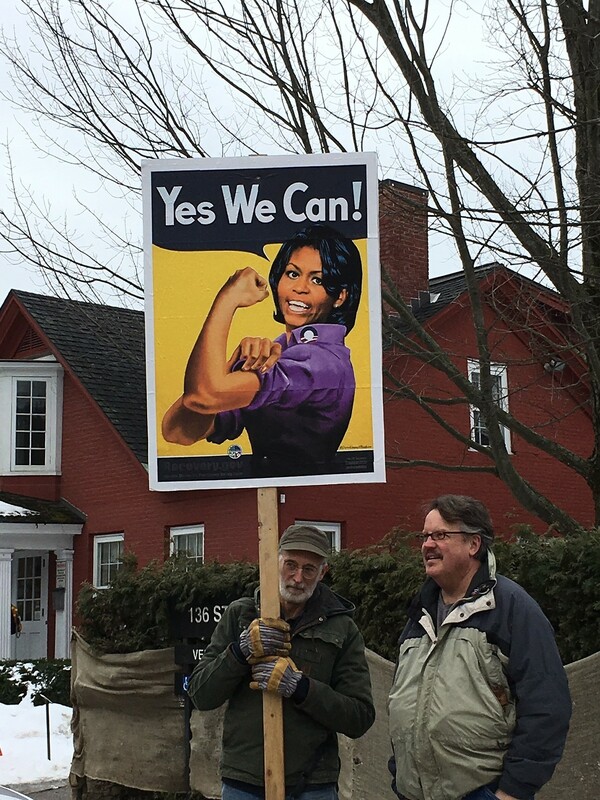 In DC: Saturday morning began with a pre-march gathering hosted for Vermont march-goers by Senator Patrick Leahy and Marcelle Leahy at the Mott House, on Capitol Hill. The overflow crowd was more than double the number originally anticipated. Our other Senator, Bernie Sanders, addressed the yuuuuge march in Montpelier. With Senator Pat Leahy at pre-march event he and Marcelle hosted on the Hill. We then moved toward the rally site, except that it was so crowded it was impossible to get anywhere near the audio speakers, so we did not hear a single speech. We were surrounded by over 500,000 of our new best friends though. Spirits were high, the crowd massive, and the signs poignant. The iconic 1971 photo of Gloria Steinem and Dorothy Pitman Hughes . . .
We reached the designated end of the march — the Ellipse by the White House — and stayed there for a while as more marchers arrived and others left. We then began to head back to Capitol Hill to join a post-march gathering with colleagues. 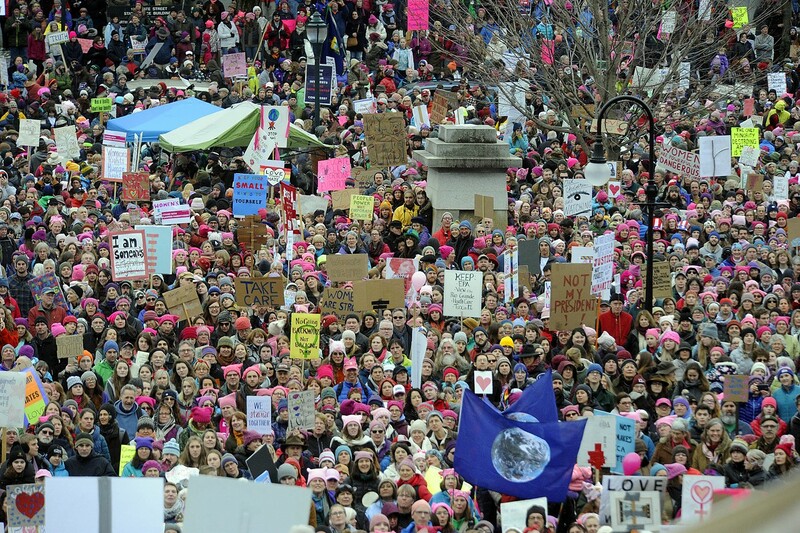 As we started back along Pennsylvania Avenue, we turned headlong into a sea of marchers who were still coming and had not yet reached the end point. To get a better view, we climbed onto the bleachers still in place from the previous day’s parade. What we saw took our breath away. By now it was 4:00 PM, and the streets were packed solid with marchers still heading toward the White House. Further along our walk back to the Hill, we met up with President Lincoln outside the DC Court of Appeals, where departing marchers were leaving message placards.